We're not talking about what Urban Dictionary describes as, "Apperance, style, or the way he or she presents themselves." We're talking about real SWAG: STUFF. WE. ALL. GET. 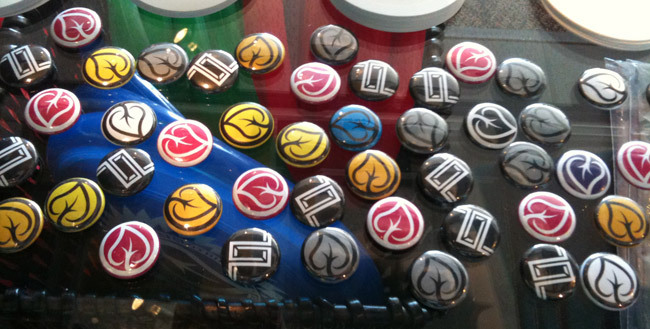 T&L has been tossing stickers, sunglasses, frisbees, and buttons in t-shirt packages for years. We're fully stocked up with keychains, buttons, and stickers right now and word on the street is that if you show us that you have a T&L keychain on your keyring you get a10% OFF ANYTHING in the store. That's saving two bucks a shirt at no cost to you! We've also got some koozies in stock to keep your beverages cold during a hot Oklahoma night. They're $2 each, (basically free if you use your 10% off keychain!). Come buy some tees, and get hooked up with goodies. Represent your T&L!